When Design Indaba started in 1995, one year after the dawn of the “new South Africa”, there were many skeptics. “It was considered quite esoteric and somewhat frivolous to talk about design in the immediate afterglow of the first democratic elections. ‘What does a country with an emerging economy have to do with design?’ was often voiced. ‘It’s about water, sanitation and housing – these are the issues of the day,’ they went on. To which we countered that we thought that these were actually design issues. But they looked at us strangely,” explains Ravi Naidoo, Design Indaba’s charismatic founder (who also lead South Africa’s bid to host the 2010 Football World Cup). Today Design Indaba is a “creativity congregation” of international acclaim, attracting more than 2100 people to Cape Town to listen to the over 30 speakers from around the world. But Indaba is now more than a deluxe conference: the “Indaba universe” is today also composed of the Design Indaba Expo (South Africa’s main design and fashion fair), the Design Indaba magazine, a programme of talks, workshops and masterclasses and other projects that are launched every year. It may seem all this is destined to a small community of designers and other well-travelled, well-educated and affluent professionals, who gather in the most European of African cities for a “global week of design” in the height of the southern summer. And we are not far from reality. In a country of 50-million people, made up of 79,6% black Africans, 10% whites, 2,5% Indian/Asian and 8,9% “coloured”, and where a quarter of the population is currently unemployed, 17% is illiterate, 18% is HIV-positive and 11% live with less than a dollar a day, a “celebration of design” can seem like a frivolous act. Knowing these facts, are South Africa’s “issues of the day” being dealt with by design and by Design Indaba? Or were the sceptics of 1995 right? We can find an answer to this question in a totally different place from Cape Town’s Convention Centre, where Design Indaba takes place. Freedom Park is one of the city’s informal settlements, 40 km from its centre. 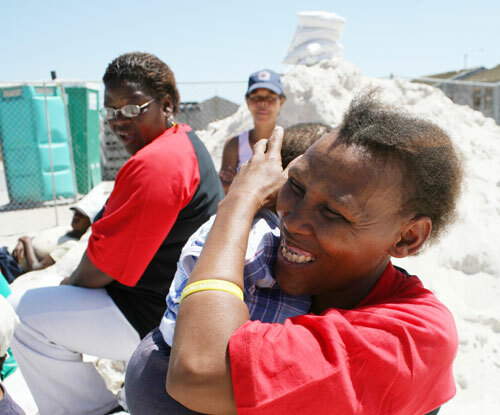 This 1500-inhabitant community occupied, in 1998, a vacant piece of land that had originally been zoned for a school inside Mitchell’s Plain, one of the region’s largest townships. 74% of Freedom Park’s population is unemployed. The demographic pressure is huge: Many families (with an average of five people per household) share the same room or shack, causing basic conditions such as sanitation, access to drinking water and healthcare to deteriorate day after day. The community has however been “urbanised” as part of a governmental scheme. Besides the implementation of an urban plan for the area, much effort has been put to find housing typologies that meet the needs of its inhabitants, among which we find Olga Jonkers, a mother of six married to an unemployed bricklayer. The housing shortage is one of the biggest South African problems. Over the years, several plans have been put into effect to address it – from the RDP (Reconstruction and Development Programme) government houses to private, philanthropic initiatives, such as the ones carried out by the Niall Mellon Fund, which has been building hundreds of houses in townships all over the country using Irish voluntary goodwill and manpower, since 2002. In 2007, Design Indaba launched its most ambitious project yet. Called 10×10, it challenged internationally-renowned architects that had already spoken at the conference (such as Shigeru Ban, Thomas Heatherwick, Lindy Roy and Tom Dixon) to work with South African architects to create innovative social housing solutions to be built on Freedom Park. “Design talk” gave way to “project action”. A total of 10 duos of architects and designers started working together, remotely and pro bono, in designs of houses whose total cost could not be more than R65 000. The initiative faced several obstacles, such as the scarcity of raw materials and the sudden increase in construction costs, caused by the “building boom” the country is experiencing in light of the forthcoming 2010 Football World Cup entailing 10 new stadiums and several other infrastructures. In spite of that, the initial goal of building 10 houses – one by each team – was promptly surpassed by Design Indaba, who raised the stakes to 10 houses – a street – per project. Of all the presented proposals, only one so far has been considered capable of going ahead, as it complies with legislation, uses already homologated materials and meets the estimated budget. The project in question, and now under construction with assistance from PG Bison, is by Luyanda Mpahlwa. Mpahlwa is the principal of MMA Architects, who are also the authors of Cape Town airport’s extension and the South African embassy in Berlin. Although he was “paired with” the British architect Will Alsop, the two teams did not get along. MMA thus continued to work, without Alsop, in the definition of a housing typology, taking into account questions such as the creation of urbanity, the use of public space and social cohesion. However, they dedicated most of their attention and effort to choosing an adequate building solution. Their first concern was meeting the expectations of the future residents: People who had lived all their lives in shacks made of anything they could find would not want to move to an “alternative” or an “architect” house. A house for them is made of bricks and mortar, it was a gable roof, doors and windows. But is there a better solution, with less costs and less environmental impact? The answer appeared in the guise of a building method based on sandbags, called EcoBeam. This method, a South-African patent, uses geo-fabric bags filled with sand as its main building element and boasts multiple advantages: Beyond tremendous thermal stability (making for houses that are warm in winter and cool in summer); it exhibits a great resistance to wind, rain and fire; and is extremely solid and safe, due to its mass and weight. Its on-site construction and implementation does not require electricity, nor skilled labour – in fact, the simplicity of the technique, which can be easily learnt, allows for the whole community – in particular women – to be involved in the construction, creating a sense of sharing, belonging and contribution to a common cause. The 10 families that will get the first houses – among which we find the family of Mrs Olga Jonkers, whose house is the first to be built – will not live in houses of bricks and mortar, they will live in even better houses. Each house was attributed to each family in a draw promoted by Freedom Park’s residents community. This community, built and lead by women, has been working in close relation with Design Indaba in identifying people’s problems, needs and expectations towards this endeavour: The intention here is not just to make some “architect” houses “land” in the middle of a shantytown, but to make a difference in people’s lives. As such, MMA Architects’ project, like all the others, will be presented to the Minister of Housing as part of an users manual, which will offer open-source solutions and prototypes for the future. This could be just the first step in a revolution in social housing for South Africa, but also for other communities and countries with similar problems in other points of the globe. All this raises countless questions, which started to be asked, and discussed, in a design journalism workshop organised by Design Indaba, which preceded the conference and whose main focus was the 10×10 initiative. Are these projects new “Maisons Tropicales” (Jean Prouvé’s modernist house designed in the 1950s, and “celebrated” by the Portuguese artist Ângela Ferreira in a project now showing in Lisbon) of global “hypermodernism”? How will Freedom Park’s community respond to the experiences – and the expectations – of the families with a new house, and the ones who were not so lucky? In what manner is the relation of power and notoriety being managed, between the “international” architects and designers and the local practises? What are the real benefits of that relation? Is 10×10 nothing else than a well-intentioned marketing and communication stunt? How will these houses and their residents be in ten years? Does anyone care? As in 1995, the sceptics will continue to play their role in questioning the notorious optimism of Design Indaba – which is perhaps the same to say the eternal optimism of design and other “project areas” – and its several initiatives towards the recognition of creativity as an economic, social and cultural driving force of a nation. It was with this optimism that, in the morning of March 1, a group of Design Indaba speakers, foreign journalists and guests visited Freedom Park, with the intention of seeing the first house being built – the Jonkers family house – less than a week after the first stone, or rather, the first bag, was laid. It is with the same feeling that Mrs Jonkers and her family moved into their new home. In the end, design does have, as it always had, everything to do with “the issues of the day”. Originally published in Design Indaba Magazine, 2nd Quarter 2008, this text is an edited and adapted translation of the article “Uma Casa para Mrs Jonkers” published on Público’s Ípsilon supplement of March 21st, 2008.